I mentioned last time that I’ve been a bit delayed in my monthly sewing because of all the moving around we have been doing to get ready for the baby. So I’ve finally caught up a little bit and some things to share with you. 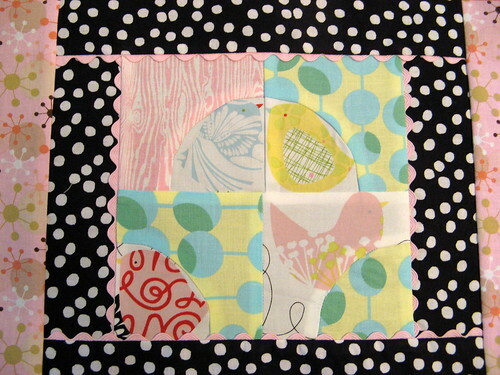 As part of the Bee Modern Quilt Group I am in, I worked on September’s blocks this week. 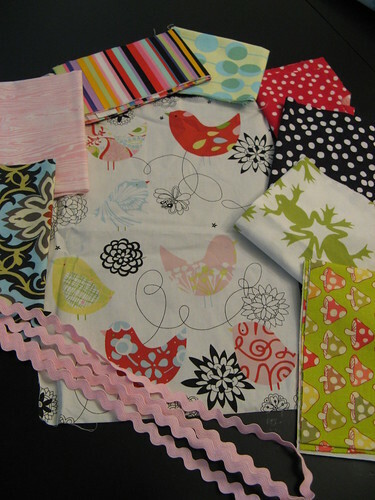 Aimee sent us a fun selection of fabrics with a focus fabric of Alexander Henry’s Starling fabric. 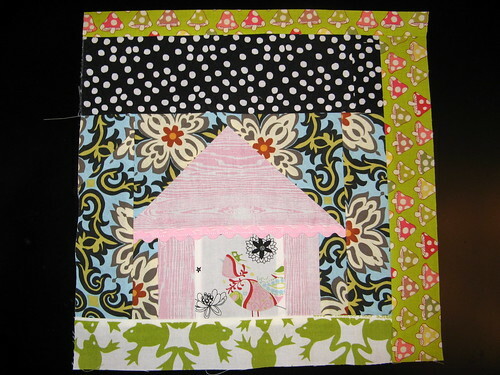 I was trying to think of clever ways to include this fabric in the blocks for the month and come up with something different than I had done before. After all, part of the reason that I want to be part of a group like this is to work with fabrics that I wouldn’t normally pick and try new piecing techniques. 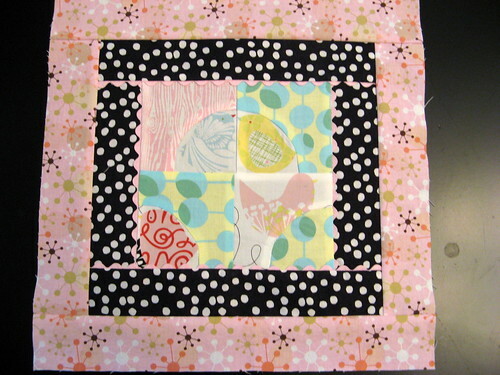 So once again I turned to curved piecing and tried to play with that a little bit more. I was fairly happy with how this block turned out and I thought that the color combinations were sort of French in style. And finally, here’s the two together. 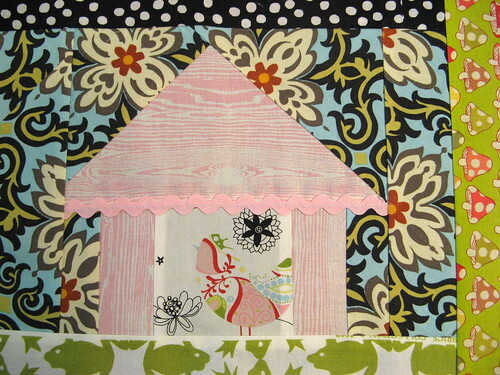 A little busy for me, but I think that is partially due to the fabrics. I just hope that Aimee like them! 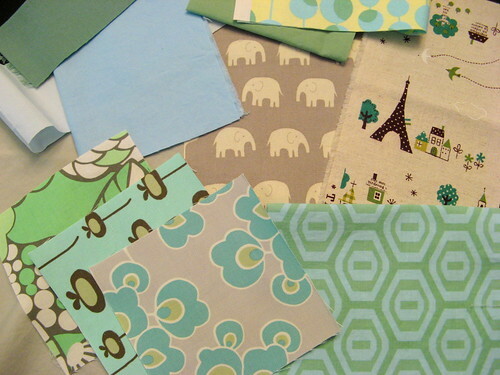 And as promised, here is a sneak peak at the fabric selections for my blocks which is coming up next. 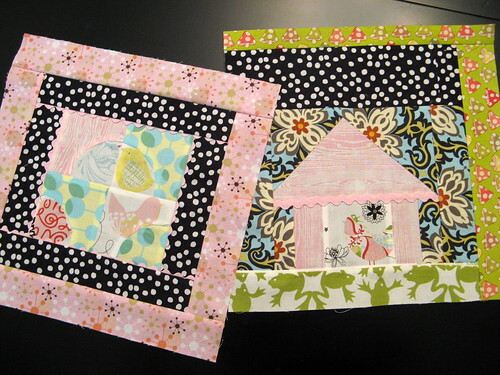 I’m going to have the ladies help me make blocks for a baby quilt and bumper for our little girl due in December. 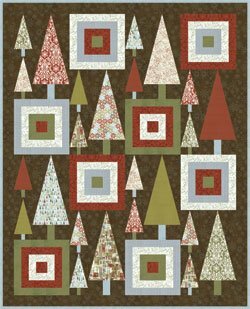 I’ve decided to embrace the December baby theme and am going to have them make a combination of tree blocks and log cabin blocks. 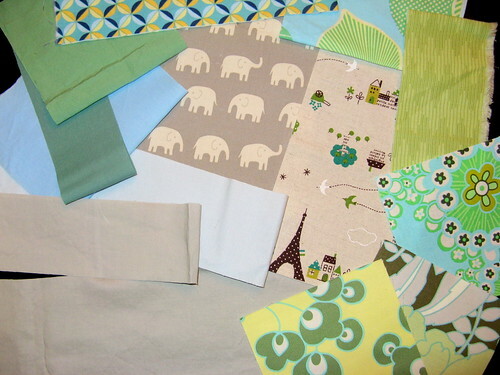 The color scheme is mainly blues, greens and greys. 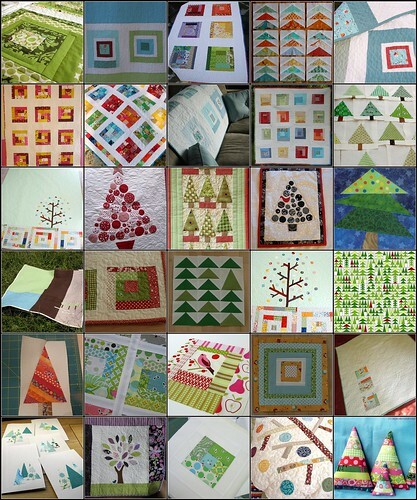 I saw this quilt layout and it inspired my selections…but of course I want to have everyone’s individual take on the blocks. I collected a bunch of images from Flickr that I want to share with the group as inspiration as well. I can’t wait to see what they all come up with. I can't wait to see what you all create for me! hi there, just came across your blog and i saw your works and wow they're beautiful! i wish i had the same creativity and skills as you do!